A mulch is a substance (e.g. bark or black plastic) which is applied to the surface of soil. The reduce the loss of water considerably and several mulches will also improve the soil. There are two groups of mulch, organic and inorganic. Inorganic mulch simply helps to retain moisture in the soil and reduces weeds. Organic mulches do the same but also improve the texture and add nutrients to the soil. The most common form of organic mulch is bark. It is undeniably expensive but it is long-lasting and attractive. In common with other organic mulches, it retains moisture by preventing evaporation from the surface. It prevents weeds by excluding light from the soil surface and providing a hostile environment when seeds land on the surface. Bark encourages bacteria and wildlife on the soil surface which in turn provide nutrients and improve the texture of the soil. Other similar forms of organic mulch include woodchip, cocoa shells and manure. Woodchip is long-lasting but will rob the soil of nitrogen until it becomes well-rotted. Manure is unattractive and smelly so is not often used nowadays. To apply organic mulches simply spread them over the soil to a depth of about 5cm (2in). Make sure the mulch is not touching the stems of any plants or trees. Click the picture on the left to enlarge it. 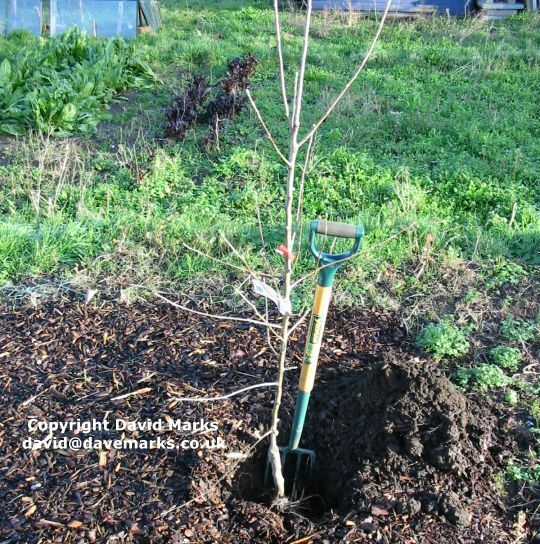 This is a new apple tree being planted in an area covered by bark. A cheap organic alternative is newspaper. 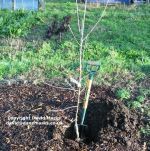 Simply place newspaper, four sheets thick, over the area to be mulched and cover lightly with soil. The soil will anchor the newspaper down and make it look more attractive. The newspaper will take a couple of years to rot down and during that time will reduce the loss of water from the soils surface. Planting can be achieved by simply cutting a hole in the newspaper. This is a good way to smother weeds and reduce the amount of weeds which grow later. Message: Old carpet works well! You can try straw, black polythene and cardboard. Message: I have managed to clear most weeds and grass off my allotment. I would like to cover it for the winter to stop weeds growing back. What materials are best and where can I find them?